Join us this Sunday December 30th for a cafe style service as 2018 draws to a close and we reflect on the year. We start at 10:45am. All ages welcome. 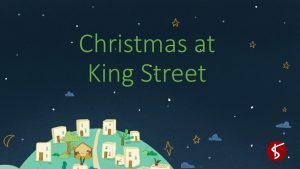 Looking for a short Christmas Day service? 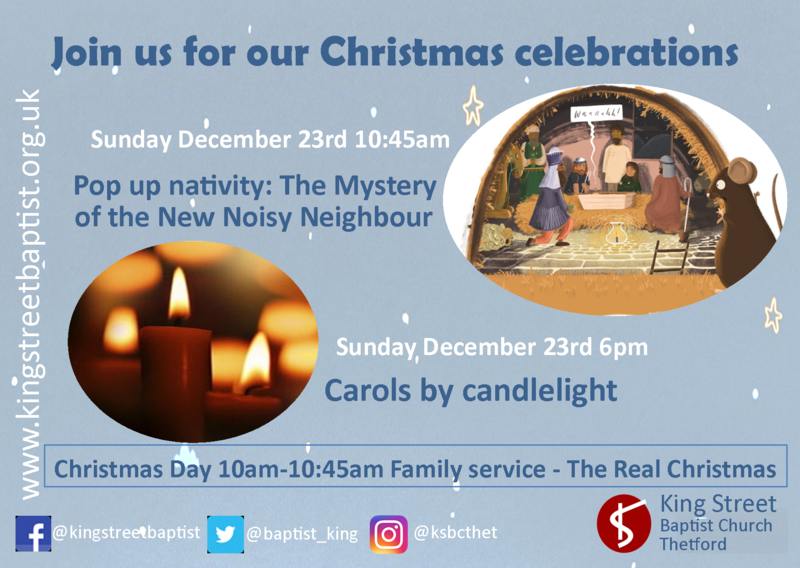 Join us at King Street Baptist Church at 10am for 45 minutes as our Minister Sally Sago leads us in celebration of the birth of Jesus. All welcome, young or old. Join us to celebrate Christmas at our pop-up nativity, for carols by candlelight and for our Christmas Day family service. All welcome at all events! These are some questions you may like to discuss in your group or consider individually following the sermon this week. It is not intended that you consider all of them in one sitting and it is suggested that alternatively you could use them as a daily devotional throughout the week. 1. The story of the birth of John the Baptist is told in Luke 1:5-25, 57-80. What similarities and what differences are there with the birth of Jesus? What facts help us to see God’s divine hand at work? 2. Read the accounts of John the Baptist in the gospels; Matthew 3:1-17, Mark 1:1-15, Luke 3:1-20, John 1:6-34. How do you picture him? How would you describe him? What was his purpose and what can we learn from him? 3. Share your testimony, of either your conversion or a time when God spoke to you that had an impact on your life and faith, with someone else and experience being a witness for Jesus. 4. What are you praying for this Christmas? 5. How can we be good witnesses for the kingdom of God? Choose one thing to work on with God to improve your witness to others in the next two months. 6. Give a word of encouragement or appreciation to someone every day this week. Join us this Sunday December 16th for our third week in this season of Advent. We are very excited to be having a baptism in the baptistry pool this morning. Our Minister Sally Sago will be giving a short talk, and she will be leading the music alongside Liz Pearce. Adults, children and young people are all welcome. We start at 10:45am. 1. Read John 1:1-5. If we understand the ‘Word’ to be Jesus what do you think it means? Why is this important for us to understand? Spend time reflecting on these words during the week. 2. John tells us Jesus was present at creation. Words are spoken. Consider Genesis 1. How many times do the words ‘and God said’ appear in the text? Why do you think this is significant or important? 3. In Genesis 3:8-9 we see God speaking to Adam and Eve. They heard God and tried to hide, but God called to them. What has been your experience of hearing from God? This will be different for all of us and perhaps depend on how long we have been in relationship with him. In order to encourage others think about how you might help someone else hear God speak. How will they know it is God? 4. Isaiah 9:6 prophesies that a child will be born. It says ‘and He will be called’. Did people prophesy over you when you were a child? She will be a doctor, he will go far, he will be good with his hands, she will be a handful! What do you think is the power of such words? What does that teach us in speaking over others or prophesying without realising? Spend time praying for release from words that may have been unhelpful and had a spiritual hold over your past life. If you are in a group ask others to pray for you. If not and you feel it would help to discuss this speak to the minister or one of the pastoral team. 5. Why do we send Christmas cards? Are they useful? Write a Christmas card to God, the Father, Son and Holy Spirit this week. 6. There are many scripture verses about Jesus being light of the world. Psalm 36:9 says ‘in your light we see light’. If through Jesus living in us we can see life in a different way, as God sees it, what do you think that means for our behaviour and our actions? Encourage others this week to see things from God’s perspective. 7. Make a list of your neighbours this week, people who live in your area – those you know and those you don’t – and pray for them. This Sunday December 9th we are very pleased to welcome back Tony Burton, who will be leading our service and bringing us the message for our second week in this season of Advent. Adults, children and young people all welcome, 10:45am. 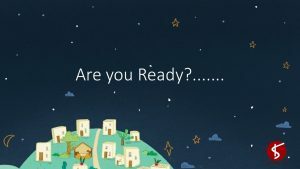 Advent week 1 Are You Ready…..? 1. What does advent mean to you? Are there particular things you do that mark out this time of year? 2. What does the bible teach us about remembering significant life events such as birthdays, anniversaries, deaths, other big events. 3. How real to you is the promise of Jesus’ return? Does it affect the way you live? How can we encourage each other in these things? Is it a good thing? Are there any dangers? Have you signed up? 5. In Matthew 1:20 the angel of the Lord tells Joseph ‘Do not be afraid’. This is a frequent phrase in the bible used when God wants to give assurance. What are your fears this Christmas? Consider Philippians 4:4-7 and Matthew 6:25-34. How are we taught to deal with fear, worry, anxiety? 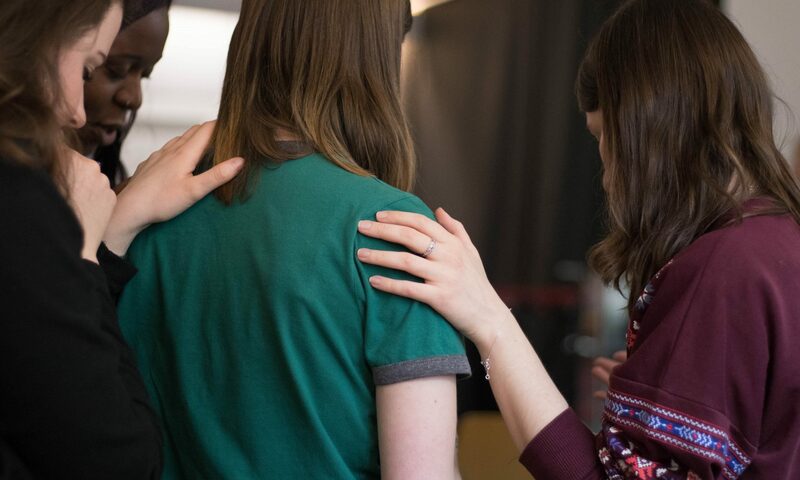 How does praying help and why is it so important to us individually and as a church? 6. What areas in your life do you think God is saying you need to grow in through advent? Have you taken a spiritual health check recently and looked honestly at your relationship with Him? How do you think you could grow more? You may want to talk about this one to one with someone you consider a mature Christian. 7. Who are the people who have helped you in your spiritual journey and faith in this last year? Remember to pray for them, and if possible, say thank you.